On Thursday, Refinery29 published an article announcing that Olivier Rousteing, the head of Balmain, “isn’t just paying lip service” to diversity in fashion. How do we know? 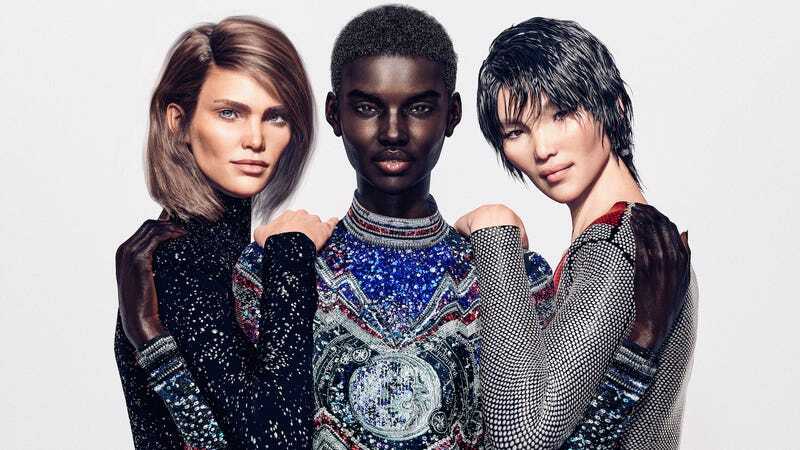 Well, Balmain now has three CGI models, two of which are not white. I would like to point out that all of them are not human. Each of these models reportedly has their own personality. Margot is French—again, reportedly. Zhi has short hair—that much I can confirm—and modeled after David Bowie. But I literally no idea what that means. “Being unique is really important because everyone has their own personality,” says Rousteing. That’s nice. In our increasingly image-driven society, it is nice that our advertisements mirror demographic shifts in our real world and feature people of color. But it would also be nice if the fashion industry employed more women who are black, Asian, Latinx, or generally not white. It would be nice if those women were paid living wages for their labor. I am assuming, but I truly have no idea, that Margot, Shudu, and Zhi do not get paid.